Everything I’ve ever made is mine. That includes the stuff I gave away. Yes, even the hat that lives in a wadded up, sad and forgotten, little ball in the bottom of someone else’s closet. Its still mine. And from now on everything will be getting a label to prove that It’s Mine. Last week Jenny of Crochet is the Way, gave us a horror story of the worst gifting experience I’ve ever heard. She made a few crochet lovely-lovies for a “friend” and they were treated with the worst kind of contempt. Readers jumped in with sympathy and love. Then we all promised ourselves that we would never, ever give our handmades to the Unworthy ever again. You know we were all lying right? We will, sooner or later, end up giving a yarn-y creation to a jerk that won’t appreciate it. Its inevitable. We are weak and soft-hearted and most of us can’t even say no to our cats. Of course we are going to get talked into giving a handcrafted gift to someone who we know won’t appreciate the work that went into crafting it. Its only a matter of time. So today I want to talk about labels. This hat is mine. I designed it. I knitted it. I wear it. 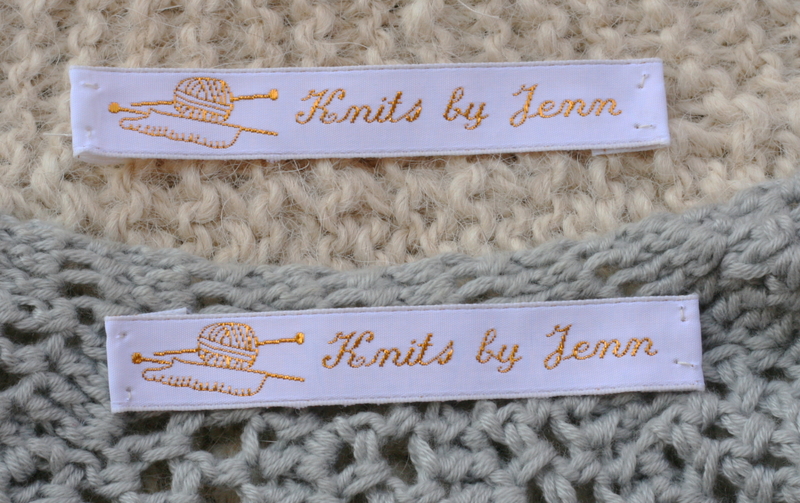 Knits By Jenn. Mine. Now it has a label to prove that. 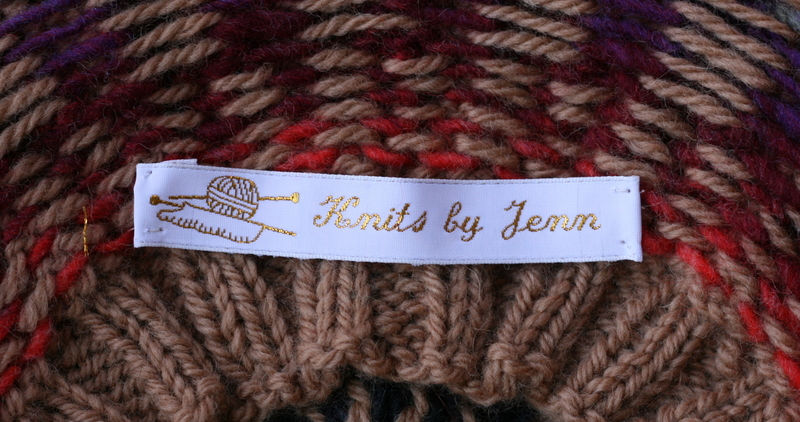 I’m slowly adding these labels to all my finished knitted stuff. I’m also adding them to my finished crochet stuff. Yep, from now all the crochet stuff will be Knits By Jenn. Why? Because its mine. Eventually all my stuff will have these cute little labels in them and when other crafters see them they will smile and say “awwww”. They will say “those are cute” and “that’s a good idea”. Yes it is a good idea and you can bet your sweet little fanny that EVERYTHING I give away from now on will have one of these labels in it. People are stupid. Is that too rude? Should I put in another way? Should I say people are foolish/careless/thoughtless/brain damaged/addicted-to-their-phone-and-don’t-know-how-to-behave-in-society? Okay. I’ll say that. But they are also stupid. does not mean they understand that they are obligated to appreciate and wear the sweater that you make for them. Why? People are stupid. We have to be veeeeeeeery plain and veeeeeeeeery clear and veeeeeeeeery imperious about this. I think that labels will help. See this label? I put that there. 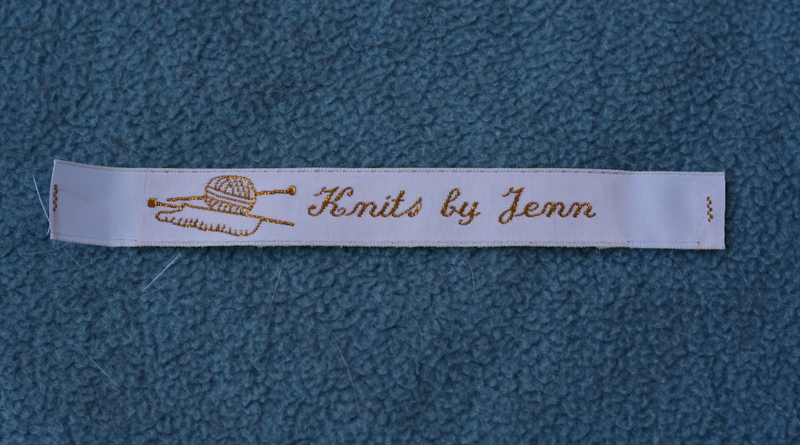 This is a Knits By Jenn. It was Knitted. By. Jenn. I’m Jenn, by the way. So this sweater is mine. I spent hours and hours and hours on it. I’m letting you take it and wear it. I really think that a label and a lecture will reduce the number of handmade items going unappreciated in this world. You can pick up cutesy generic labels in almost any yarn shop or craft store. Those are the kind that say “Made with love” and “knitted for you by:” Here is a link to a set that you can order from Jo-Anns. They are very nice and very well made. I’m told the order took an extra month to fill and I think that is because it was a custom job. And it was a pretty big order. 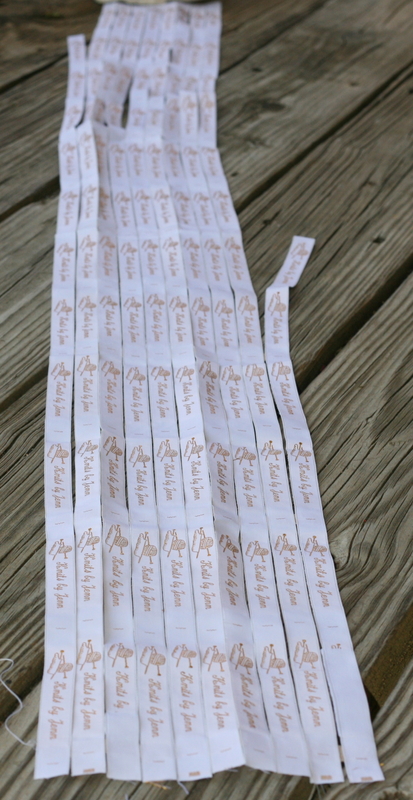 I won’t be running out of labels anytime soon. 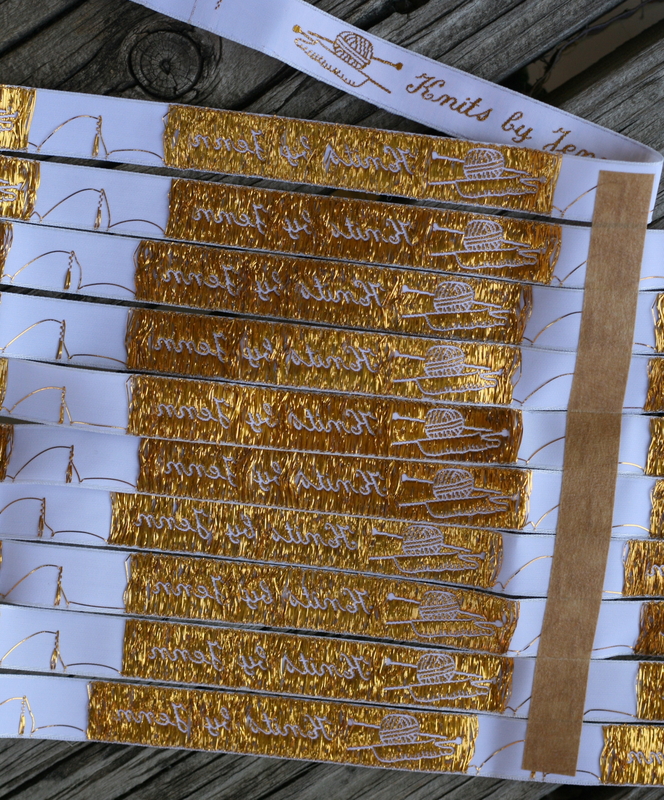 Dear crafters, arm yourself with some labels and practice your lecture. Don’t go into this holiday season (oh yes, its coming) unprepared. Remember, if you made it, its yours. Now and always. You are simply letting them borrow it for awhile. 21 Comments on "Because It’s Mine"
That means that the stack of scarves, shawls, quilts, etc., only grows taller. Giving my handicrafts is my way of cleaning house – come what may. I don’t look back……..
Good attitude to have. You must stitch like the wind. I take for-e-ver. That is a good policy. I wish I could be like that. I’m weak though. I’ll get talked into making a something-or-other for someone. And that something-or-other will have a label with my name on it. Ya, but I get tired of the project halfway through so unless I know they will love it, it isn;t worth my boredom LOL! I get bored halfway through all too often. then I get sick of that color (doesn’t matter what color, I’m sick of it). Then I start having fantasizes about starting other projects. Then I gut it out and finish. Ooo! Great tip! Thanks for sharing it. 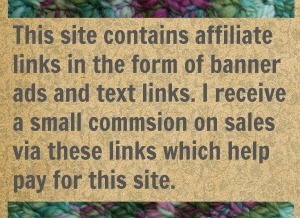 I accidentally found this blog while browsing G+ for crochet posts. I love it! Have been reading your archives and feel like I found some great friends although I don’t know ya’ll. I am also a cat slave. I am owned by 6 rescues. The crochet horror story really hit home. I have gifted too many unworthy people. Sadly most were family. Again my current project is thread crochet (blind & crazy) snowflakes for my grandson. At his request. Again thank you thank you for this blog! I’m glad you found us! 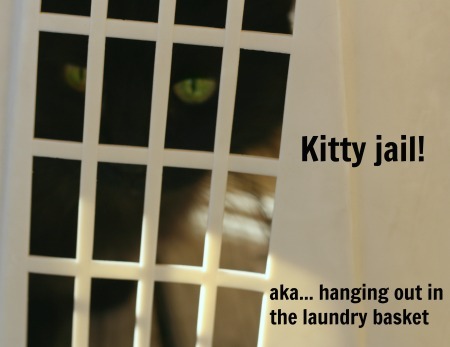 A cat’s human slave who is going blind and crazy with some thread crochet is just our speed. The labels are lovely. I bet Unnamed Gifter gets a handmade with one on it! Does a “no” count if you can’t make it stick? I didn’t think so. None of mine seem to ever stick. Not even when I yell NO! and throw a pillow. And yep, Label-Gifter will be getting a label back (at least one) with some knitwear attached. The labels are a lovely and thoughtful touch. I’m sure your gifts are treasured. Separation is hard, esp after the hours of work and the thoughts of the giftee that come with the work. Yes separation is a hard step to go through. I miss many of my yarn babies. Maybe sticking my label on them will help with that too.